There are few stars let alone sidemen in rock’n’roll who can boast a CV to rival that of the late Billy Preston. He played keyboards with the Beatles on the albums Abbey Road (1969) and Let It Be (1970) and on the roof of the Apple Building during their final live performance in 1969. And he was prominently featured in the recording of many albums by the Rolling Stones, from Sticky Fingers (1971) to Bridges To Babylon (1997), as well as playing a starring role in the group’s touring line-up for much of the 1970s. Strutting around the stage with his huge Afro hairdo, brightly coloured suits and keyboard wrapped around his neck, Preston became an iconic figure of the 1970s. As a solo act with a singing voice rich in R&B and gospel traditions, he enjoyed US No.1 hit singles with ‘Will It Go Round In Circles’ (1973) and ‘Nothing From Nothing’ (1974) along with a Grammy-winning instrumental hit ‘Outa-Space’ (1972) and his UK favourite ‘That’s The Way God Planned It’. Although latterly beset by legal, personal and health issues, Preston maintained a stellar contributing role to the end, playing clavinet on the Red Hot Chili Peppers album Stadium Arcadium, released in 2006, the year that he died at the age of 59. Billy Preston was born in Houston on 2 September 1946 and grew up in Los Angeles. His mother was a devout churchgoer, his grandfather a minister. He started playing piano and organ in church at a young age, and when he was just 10 years old he appeared live on TV, playing and singing a duet of ‘Blueberry Hill’ with Nat King Cole. Little Richard hired Preston, aged 16, for a proposed gospel tour of Europe in 1962. “We did one gospel number and the kids looked so strange,” Preston recalled. “Then he let loose with ‘Awapbopaloobop Alopbamboom’ and [the idea of playing any more gospel] was all over.” Thus was Preston introduced to rock & roll, and to the Beatles who, along with Sam Cooke, were one of the support acts on the tour. On returning to America, Cooke hired Preston for his own band and signed him to his SAR record label for which Preston recorded several albums of primarily instrumental music including The Most Exciting Organ Ever (1965) and Wildest Organ In Town! (1966). These albums, featuring churchy-but-cool arrangements of contemporary standards such as ‘Drown In My Own Tears’ and ‘Don’t Let The Sun Catch You Crying’, are the most amazing period pieces, providing the original template for various Acid Jazz and easy listening revolutions in the decades that followed. Already a consummate musician and a born showman, Preston was hired by the US TV show Shindig! He performed both in the house band and as a featured singer and dancer, a kind of variety show version of James Brown. His reputation quickly spread and Ray Charles – whom Preston idolised - invited him to join his Roadshow as a featured performer. George Harrison saw him playing with Charles and invited him to work in London with the Beatles, who signed him as a solo act to Apple Records. The 1969 single ‘Get Back’ was credited to “The Beatles with Billy Preston”, the only time that the most successful group in pop history ever shared a label credit in this way. Preston released two of his own albums on Apple – That’s The Way God Planned It (1969) and Encouraging Words (1970). Both albums were produced by George Harrison and featured a supporting cast of musicians that was more of a supergroup than a backing band: George Harrison and Eric Clapton on guitars, Keith Richards on bass and Ginger Baker on drums, among others. The title track of That’s The Way God Planned It had already been a No.11 hit single in the UK before the album was released. And among the tracks on Encouraging Words were two songs written, but not yet recorded, by George Harrison: ‘My Sweet Lord’ and ‘All Things Must Pass’. So it is difficult to fathom how Apple failed to get either of these albums even to register in the charts - an extraordinary feat of anti-marketing, when you think about it. Unsurprisingly perhaps, Preston left the label soon thereafter and in 1971 signed to A&M records where he enjoyed his most successful years as a solo act. In 1972 he reached No.2 in the US with ‘Outa-Space’ a high-energy instrumental track which was one of the first occasions that the clavinet was used to play funk. The song won him a Grammy for Best Pop Instrumental Performance. He followed this with a run of three, million-selling hit singles in the States: ‘Will It Go Round In Circles’ (originally a B-side of his version of the Beatles’ song ‘Blackbird’, released in 1973), ‘Space Race’ (1973) and his church-organ-soul-funk-singalong classic ‘Nothing From Nothing’ (1974). It was during this, the period of his greatest solo success that Preston was also at his busiest with his session and sideman work. He played a heroic and fondly remembered part in George Harrison’s historic Concert For Bangla Desh in 1971 and contributed to many landmark albums of the time - from Sly and the Family Stone’s There’s A Riot Going On (1971) to Bob Dylan’s Blood On The Tracks (1975). Having won the trust and friendship of the Beatles, he came to the attention of the Rolling Stones, with whom he forged an even longer-lasting bond. He worked on a string of their classic albums including Exile On Main St. (1972), Goat’s Head Soup (1973) and It’s Only Rock’n’Roll (1974). His presence was particularly telling on the Stones’ 1976 album Black And Blue, on which the song ‘Melody’ bore the unusual credit “inspiration by Billy Preston”, in recognition of the fact that it was a thinly-disguised rearrangement of Preston’s own song ‘Do You Love Me’. Quite apart from his musical abilities, Preston’s upbeat personality combined with his long experience of being around superstar egos made him a significant social asset in any high-pressure, group situation. And he was good at providing inspiration to the people around him. It was his phrase “If you can’t be with the one you love, love the one you’re with,” that gave Stephen Stills the idea for the song ‘Love The One You’re With’. And together with Bruce Fisher, Preston wrote ‘You Are So Beautiful’ an evergreen hit for Joe Cocker among others. He switched labels once more, signing to Motown in 1979 and immediately scored the biggest trans-Atlantic hit of his career with the ballad ‘With You I’m Born Again’ a duet with Syreeta Wright from the album Late At Night. Preston was both deeply religious and discreetly gay – a difficult balancing act. He grew up in the warm embrace of the church, but was sexually abused as a boy, a trauma which doubtless contributed to the emergence of a self-destructive pattern of behaviour in later years. In 1991 he was jailed for cocaine possession and sexually assaulting two men. He was jailed again in 1997 on a probation violation and for insurance fraud (after burning his own house down). Yet even as the shadows were gathering throughout the 1990s and into the start of the new century, he undertook recordings and tours with Eric Clapton, Ringo Starr and others. He also returned to his gospel roots, recording albums of church music including Minister Of Music (1995) and Words And Music (1996). By 2001 his health was beginning to fail. High blood pressure led to hypertension and kidney disease and in 2002 he received a kidney transplant which might have been more successful if, after being discharged, he had not gone on a crack cocaine bender. He died in 2006 from respiratory failure brought on by pericarditis. Preston was a singing-songwriting star of considerable presence and magnitude. And he was a musical pioneer whose fast, attacking, staccato keyboard style became an established technique of funk organ and clavinet playing. But it was his ability as a team player that was nonpareil. 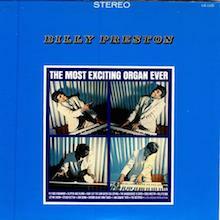 As the late John Holmes would tell you, it's damn near impossible to live up to a title as lofty as The Most Exciting Organ Ever, but Billy Preston does his best -- the raw physical power of Preston's performances are matched only by the imagination and virtuosity of his phrasing. The music bridges the sacred and the profane, fusing the deep, bold sound of the church with the razzle-dazzle of R&B. While Preston's innovative use of bass pedals lends the music its pendulous bottom, his melodies defy gravity, soaring and dive bombing like birds of prey in flight. 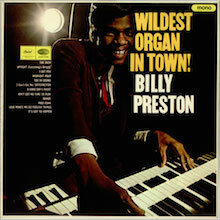 A late '60s Capitol set with Preston displaying his jazz/blues side as an organist. Unfortunately, nothing on this album caught fire, even in the R&B community, and Preston would soon go on to work for Ray Charles and the Beatles. His early prowess as a flashy organ equivalent of Jimi Hendrix has been largely forgotten or overlooked, and the fact that this album hasn't been in print for many years hasn't helped. 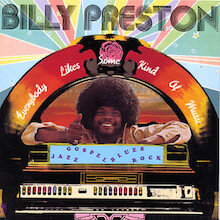 On Everybody Likes Some Kind of Music, Billy Preston attempted to put together a sound as wide-ranging as the album title. The jazzy "How Long Has This Train Been Gone?" is clearly patterned after classic show tunes, while "My Soul Is a Witness" is a straight-ahead gospel song, complete with a choir. Add to that the country of "Sunday Morning," the '70s soul of "I'm So Tired," and the funky instrumental "Space Race," one of Preston's most enduring classics, and the result is a wildly diverse album. That doesn't necessarily mean, however, that it's a completely successful one. Because most of the experiments are so short (barely clocking in at two or three minutes), they don't really register as complete songs, the way the longer soul and funk tracks do. That's not to say that Preston is a dilettante, since each of the genre tracks are well-performed and carefully produced. It's just that Preston should have chosen one or two genres to experiment with and composed fully developed songs, since he clearly has the talent to do so. The funk and soul tunes are excellent, much more thought-out and constructed, and are what make the album worth listening to.